This is a special guest post by Mark den Hartog of Meet Me Onboard. Azamara is a proud partner of Meet Me Onboard, the largest gay cruise community online. Mark and Dale traveled as guests of Azamara. The Welsh port city of Holyhead (pronounced Holly-head) is situated on the beautiful windswept island of Anglesey in the Irish sea. Over two million visitors a year pass through this port which provides fast, low-cost ferry passage to Dublin. Just steps from the terminal, we walked the steep and winding streets to enjoy this laid-back, unpretentious small town. The ancient parish of St. Cybi’s Church claims a stunning view of the bay, and offered a Men’s Choir concert celebrating the magnificent tradition of Welsh choral singing. 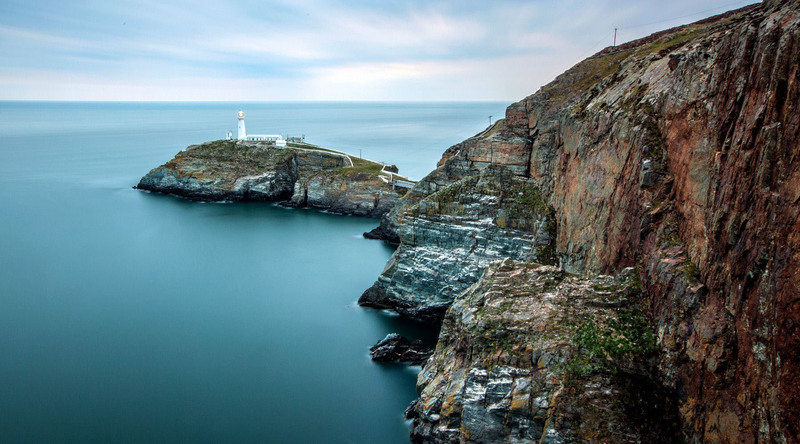 One of the most dramatic sites on the Island is South Stack Lighthouse, about three miles from Holyhead. Athletic visitors walk the three miles to the site, but we took a taxi to save energy for the hike itself. Our driver explained that the ferry traffic and cruise visitors generate nearly the only economy remaining on the island besides farming. Completed in 1809, the lighthouse is accessible by a challenging hike down the cliff. That, plus the climb up the lighthouse itself and back requires about 1,100 steps, depending on which local source is consulted! We went with the highest quote simply for the bragging rights. The lighthouse keeper on duty was friendly and good-humored, dispensing encouragement to visitors deciding whether or not to actually climb the steps of the lighthouse itself. She explained to us that her job mostly involves interacting with visitors since the beacon now operates by automation. We loved the unspoiled nature of the place, especially after visiting the bustling city of Dublin. While challenging, the walk was on a developed path making it doable for nonathletic visitors like Mark and me. Taking even a few steps down the path affords breathtaking views of the roiling sea and a limitless horizon. Stopping every few steps to take photos and enjoy the setting, we heard the chatter of countless birds (bring your binoculars) and watched acrobatic gulls catching updrafts. The visit to South Stack Lighthouse cemented our respect for the residents of this Island and their culture so closely bound to the sea. Cruise to Holyhead, Wales in 2017 on this voyage.